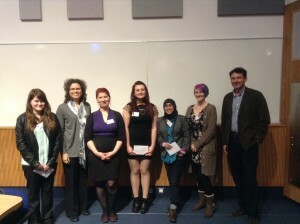 The British Psychological Society Wessex Branch Student Conference 2014 was hosted by the University of Surrey recently, organised by Dr Adrian Banks. This was a brilliant day of stimulating presentations and posters showcasing some of the excellent work conducted by undergraduate and postgraduate Psychology students in the Wessex region. Surrey students achieved two prizes with Erin Brennan, Lauren Colgan, Annette Murphy and Emily Turton (supervised by Dr Kate Gleeson) winning first prize for Best Poster, and Aino Ylitalo (supervised by Dr Rachel Avery) winning third prize for Best Presentation. A BIG well done to all students who took part and helped out on the day and thanks to Dr Adrian Banks for organising such a motivating day for all.